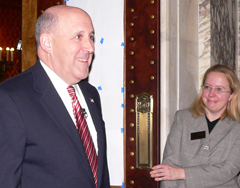 Governor Jim Doyle goes after the rich, the oil companies, and smokers in his proposed state budget. Doyle calls for deep cuts in state spending – $2.2 billion worth – deepest in state history according to Doyle, who also says he has no plans to increase middle class taxes. “My budget stands up for the people who earn regular paychecks, and the people who through no fault of their own, have lost theirs,” the governor told a joint session of the Wisconsin legislature Tuesday night at the Capitol in Madison. Doyle said his proposed budget will do more than simply close the state&apos;s staggering budget gap. “Under this plan, we will finish the biennium with a positive balance of 270 million dollars,” said Doyle. “We will put our tax collections in line with our future spending commitments, and cut what is called the structural deficit to the lowest level in ten years. The Governor also wants to increases the tax on a pack of cigarettes by 75 cents. “I hope that&apos;s a tax we don&apos;t collect for very long,” he said. “The purpose here is to stop kids from smoking, to help people quit, to include public health, and to drive down our state&apos;s health care costs.” The governor also renewed his call for a statewide indoor smoking ban.